What's the Best Yoga Mat?-The fit sisters. Anyone who has an answer to this question, besides me, please leave a message. I mean this always starts as a journey to wonderland. And then it ends up with me wanting to buy at least 5 different mats. What I found works best for people like me, who are too curious and want to try too many things at a time, is to set one priority. In this yoga mat story, I decided that my 1st priority is to choose for a mat that is as non-toxic as possible, no PVC, no latex, please. So any mat out there, even if it's branded as eco-friendly, won't do it for me unless there's a clear reference to the non-toxic materials used, no chemicals and phthalates. Of course, I want an excellent grip, non-slipping, beautiful design (o.k. that's not a priority), good thickness, etc. But first I want it to be as natural as commercially possible. Even if some of them are branded as free of toxic, check out if PVC is used. Not to mention heavy metals (but this is something we'll never know I think). The main ingredient of PVC is vinyl chloride (commonly known as vinyl) which is a known human carcinogen, the most toxic plastic. But I'm not a scientist, I'm no specialist in any way. I'm just trying to use some common sense processing all this information we see on yoga mats. They are sold everywhere lately. 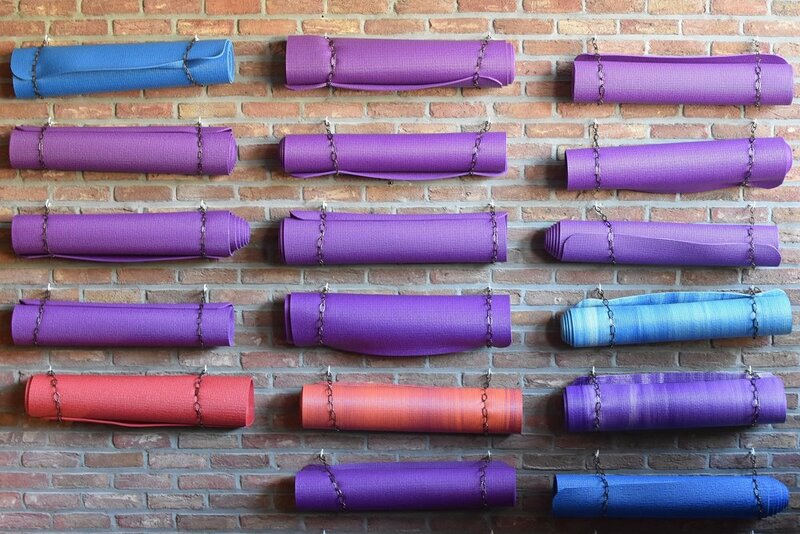 I don't know where you live but in Amsterdam, almost every shop sells yoga mats. Especially, design shops, concept stores, etc. I know that many brands nowadays mention that the PVC affects us in a negative way only if exposure is excessive. And of course, PVC is in so many places. Your rainwear might have PVC or your car interior, your shower curtain, etc. I get that. But if I can opt out for at least the products I have a choice, I will. Afterall, we exercise because we want to feel healthy. So I don't see how yoga can be considered healthy when we work on a toxic mat. And there you are breathing in and out, feeling good about yourself...breathing PVC gas? Not to mention it can't be recycled. Like you profess solidarity, you salute mother earth and then you use non-recyclable products for your practice. We did that and we still do. But let's try to limit the damage we do whenever we can. This is not the '90s. On the other hand, Manduka says that for their PRO series they use a safe eco-certified PVC (PVC that is phthalate free) and so because of their durability their PRO mats last forever, we don't need to replace them, and so they are environmentally friendly. Could it work for you? That's one to try out. So before you go crazy here's 3 yoga mats I like but then again don't take my word for it. Unless I get advice from the CEO of the company and a chemist, I'd never be 100% sure about what these mats contain. I love the Jade mat and they're made from natural rubber. Price wise they are expensive so look for alternatives if you don't want to make an investment now. I chose for the Manduka eKO. Good quality, not super grip but I'm happy with the PVC free material. Sportbay Eco Fitness Mat is an affordable alternative. I never used it but read the reviews, the materials used, and I know a few people use them in my classes so I'd go for them. Especially if you don't practice often. And if you need some inspiration design then I heard the Affirmat mats are really cool. They have these inspirational quotes written on them to put you in the right state of mind. If you are that sort of person. Cork mats are also becoming well-known lately but I haven't used one so I can't recommend. Oh yeah, and as much as I love the DOIY design mats (I see them everywhere lately), the PVC is a no go for me. Pitty cause I really like the thickness, the grass design. And the price. Just remember that natural rubber ones may contain latex, so if you're allergic stay away from them. And I find that the cotton or the ones made with jute are very slippery so better use them for meditation or Asanas only. Last but not least, if you don't mind so much about the material then get yourself a mat that has a surface you can easily clean. That's my 2nd priority. I'm not affiliated with any of the brands above so keep that in mind.